HARARE (Reuters) - Production of tobacco, Zimbabwe's biggest export earner, is expected to fall 15 percent to 160 million kilograms this season following a drought that has left millions facing hunger, an industry survey showed on Wednesday. Zimbabwe earned $855 million from tobacco sales in 2015, nearly a third of its total exports and far outpacing receipts from platinum or gold. Farmers produced 189 million kgs of tobacco last year but an El Nino-triggered drought caused long dry spells that forced farmers to delay planting, affecting this year's output. 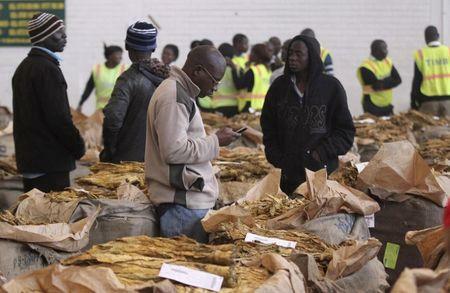 Zimbabwe's tobacco selling season began on Wednesday. Monica Chinamasa, chairwoman of industry regulator the Tobacco Industry and Marketing Board, said 72,000 farmers had registered to sell their crop compared with 91,000 last year, blaming the decline on drought and a lack of financing for producers. Before 2000, when President Robert Mugabe's government started seizing land from white-owned commercial farmers for redistribution to blacks, only 4,500 farmers grew Zimbabwe's entire tobacco crop. "There is need to empower farmers to overcome the adverse effects of low and erratic rainfall, mid-season droughts and extending the growing season," Agriculture Minister Joseph Made said in speech marking the start of the 2016 selling season. Zimbabwe exports the bulk of its tobacco to China, which has become the largest investor in the Southern African country. Up to 4 million Zimbabweans face hunger due to the worst drought in more than two decades.